European Knights made a bold decision during the Seventh Crusade, but they faced formidable terrain and tough opponents at the Battle of Al Mansourah. After a century and a half of efforts—with mixed success—by Western Europe to seize control of the Holy Land, the Seventh Crusade of 1250 led by Louis IX of France was the last best chance to change the political and military situation in the Eastern world before the Reformation. Like all but the first, this crusade had its roots in the ones that preceded it, most especially the Fifth, which attempted a flanking maneuver by seizing Egypt first. The Seventh would follow that pattern. The crusading period began in the 1090s with Pope Urban II’s call for a force to recover the Holy Lands from the Saracens. The success of that venture established four crusader states, including the powerful Kingdom of Jerusalem, and was due in large measure to the disunity then prevailing in the Muslim world. But the strengthening of Muslim power in response to the Latin Kingdoms led to a hundred years of warfare and the slow loss of territory by the Christians. This began with the fall of the city of Edessa in 1144 and culminated in the victories of Saladin, reducing the Latin Kingdoms to some isolated fortresses, mainly on the Mediterranean coast. Strategically, the Fifth Crusade prefigured requisite conditions under which Louis IX was later to struggle. Both in its Levantine phase and when the scenes of battle shifted to Egypt, the control of sea lanes and the ability to resupply and reinforce the armies were essential to the crusaders’ ability to prosecute the war. In Egypt, the military objective was the capture of the Muslim stronghold of Damietta, located on the eastern branch of the Nile in the Nile Delta. The attack on Egypt was proposed for a variety of reasons. First, the Nile Delta was the Muslims’ richest province. Second, it was thought that control of Egypt meant command of an easy outflanking route to the cities of Palestine (an indirect approach). Jerusalem, therefore, would be the focal, vulnerable center of a pincer movement from Acre and Suez. And, finally, Egypt’s capture would ensure naval control of the Eastern Mediterranean. The focus of the attack became the fortress city of Damietta because it afforded easy access from the Holy Land ports. It provided more control over the sea and land route to Cairo and also offered a less problematic route of retreat should that prove necessary. Also essential to the success of their strategy was control of the Nile and of the local waterways and canals close to Damietta and to the crusader camp. Much of the conduct and eventual failure of the Fifth Crusade boiled down to differences between Cardinal Pelagius, the papal legate, and the nominal military leader John of Brienne (King of Jerusalem) concerning questions of political and military control. The fact that the militarily inept Pelagius was able to set the terms of strategic and political objectives led directly to the debacle. The crusaders, having captured Damietta, advanced in force up the Nile toward Cairo. This disastrous offensive was a classic illustration of an ill-advised, unsupported overextension, in which the naval forces of the sultan were able to control the waterways behind the advancing crusaders and gain control of a canal the crusaders thought unnavigable (but which rose with the rising Nile). With positions cutting off the retreat and control of the sluice gates, the sultan’s forces were able to extract favorable terms by holding the crusaders hostage even though they retained Damietta and had naval command of the Nile mouth and Delta. It is clear from the circumstances of the Fifth Crusade, and the disastrous end to which it came, that the almost total control that the Christians held of the maritime supply lanes and several local waterways of Egypt were not enough to conquer the territory. They were, however, of great significance and were sufficient to achieve the reasonable results for which a Crusade was being waged—the return of the lands of the Kingdom of Jerusalem to Christian jurisdiction. Had the Muslim forces been able to contest the Christian landings or been able to cut their lines of communication, supply, and reinforcement, or yet to threaten the coastal ports of Palestine, they may have been able to save Damietta. The story of Louis’s interest in leading a crusade is perhaps apocryphal, but it was widely disseminated, and widely believed, and was to be key evidence in the campaign for his sainthood. In December 1244, he fell desperately ill. On his sickbed, he vowed to lead a crusade. This vow was supposed to have been prompted by a vision of the fall of Jerusalem. The Holy City had indeed fallen to a concerted Muslim attack in August of that year, but it is unclear when the news reached the western states. A palace revolution in 1243 had placed Sultan as-Salih Ayub on the throne of Egypt. The barons of Acre and the Templars proceeded to negotiate for a renewal of the truce with the new sultan’s enemies, the sultans of Damascus, Homs, and Aleppo. As-Salih, furious at what he considered a betrayal, summoned the Turkish bands called the Corasmins from Mesopotamia. On their way through the Holy Land, they laid waste the Galilee and reached Jerusalem, devastating it in August. At La Forbie, near Gaza, the Egyptian army and its Turkish reinforcements destroyed the Frankish army and its Syrian Muslim allies. According to a letter from the Patriarch of Jerusalem to the French and English churches, only a few hundred Frankish combatants remained in Syria. Upon his recovery from illness, which he ascribed to miraculous causes, Louis promised to fulfill his vow. Although declared under the auspices of a call by Innocent IV, Louis was the prime mover and financier of the new crusade. In an assembly in Paris called by Louis in October 1245, he won baronial approval for the campaign, and many lords took the cross that day. Louis raised money by large taxes, including taxes on the clergy, much to their fury. Agents of the king hired ships for transportation from negotiations carried out with corporations in Genoa and Marseilles. Louis made arrangements for the governing of France in his absence. And Innocent’s legates were not idle, preaching the crusade throughout Germany, Scandinavia, and England, as well as France. But the delay was protracted and harmful to the expedition. In order for it to move on, because of the sailing conditions of the Mediterranean, the invasion fleet would have to depart in October. Yet Louis’s force had still not assembled in full by that time, making it necessary to delay the beginning of the campaign into the next year. As it turned out, the expedition did not get underway until May, and the intervening months were disastrous. 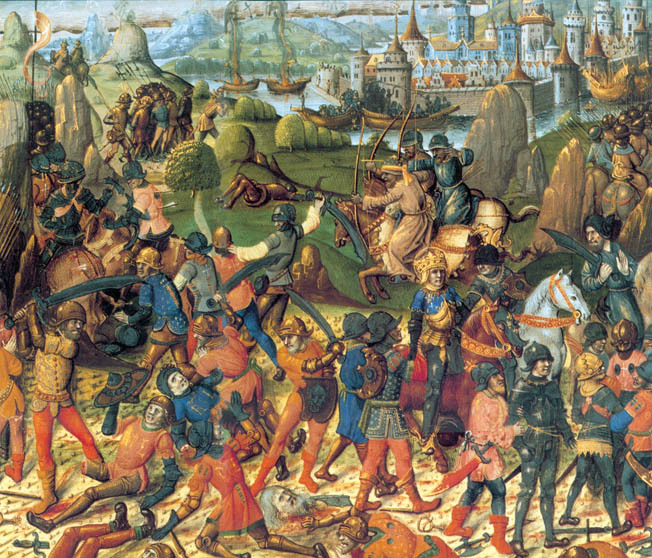 At least 250 knights, along with other troops, died during the winter. The Europeans blamed the climate, and Louis had to issue a prohibition, severely enforced, against leaving the island. However, other crusaders continued to arrive and make up somewhat for the losses. 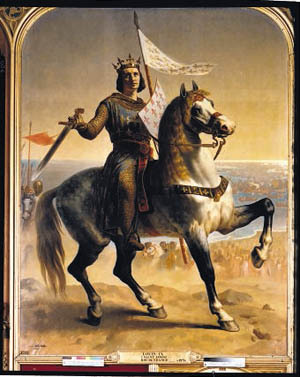 It could still be said of a crusading force in the 13th century, as it was regarding the forces of the 12th century Frankish kingdoms in Syria, that “knights who owed service for fiefs—either in land or money—formed the backbone of the army.” King Louis IX was to be entitled to go beyond the feudal muster and enlist any able-bodied man available for the infantry. Undoubtedly, he was able to make use of the common practice of hiring mercenaries. This method had been used on an ever-increasing scale throughout the 12th century in the fighting in Syria. Louis was also able to call upon the services of the military orders of the knights of the Templars and Hospitallers. The force thus assembled in Cyprus, by the acceptance of vows by the fighting nobility, was similar to that raised by the king in his secular duties. The extended stay in Cyprus also had a profoundly severe effect on the finances of the crusaders. Those less well off were caught with expenses beyond their means. Indeed, Joinville himself, the chronicler of the crusade, mortgaged his property to pay for his own service and took along 10 knights for whom he himself paid. These knights consistently held him under threat to leave if he failed to pay them. But when Louis took Joinville into his service, the resulting pay gave him a surplus. It was partly by putting knights onto his payroll that Louis was able to keep his force together. Thus arrayed, Louis had perhaps 15,000 men, according to one estimate. It was truly a large force, but whether it was adequate to the task was yet to be seen. The army, boosted by troops from Acre, finally sailed from Cyprus at the end of May. It is unclear at what point the decision had been made to attack the Damietta mouth of the Nile and the city of Damietta, but it had long been understood that Egypt was the destination. For one thing, as Louis reasoned, there were limited opportunities in Judea. Muslim power there was strong, and any attempt made upon it would force the crusaders inland, far from their bases of supply on the coast. Egypt allowed the Christian forces to use their control of the sea lanes to the fullest, and with Egypt in their hands they would have a powerful bargaining chip for the return of Jerusalem. What was true for the Fifth Crusade was also of importance in determining the objectives of the Seventh. For Louis “had grasped the fact that the Frankish kingdom of Jerusalem was an impossibility so long as there was a strong Egyptian army. In these circumstances, it was eminently reasonable to plan an invasion of Egypt.” The object was correct, but it was an open question whether the particular strategy employed was flawed or valid. One potential pitfall: Damietta was a poor base from which to attempt the conquest of Egypt. Still, it was obviously no surprise to the aging sultan that Damietta was the immediate objective of the crusade. A garrison was placed in the city, and the rest of his army was laid farther up the Nile to attempt to block the landing. The Egyptian army at this time was still under the Ayyubids , the Egyptian dynasty originally founded by Saladin and his uncle after overthrowing the Fatamids. Although the largest army in the Muslim world, it was still mainly a highly trained, elite cadre of cavalry and infantry regiments. A heterogeneous force with recruits from various nations, it was undergoing a unifying period under direct control of the Egyptian sultan. Changes had been occurring since the time of Saladin in recruitment, costume, and equipment. Infantry was being relegated to siege warfare while horse archery was gaining prominence. These tactical changes would play an important part in the coming battle. Actually, they were as pebbles compared to the grains of sand of the Egyptian forces. This was a common problem for Frankish armies in the crusading period and a major reason for their defensive tactics, according to notable crusades historian R.C. Smail. 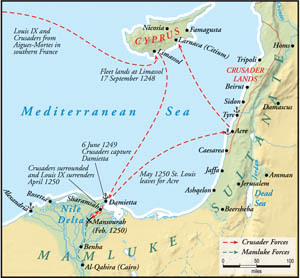 The crusaders’ squadron arrived off the Damietta branch of the Nile on June 4, 1250. Although his advisers cautioned delay to await the arrival of some transports that had been separated from the rest of the fleet, Louis refused. The landing began at dawn the next day, on the sandy shore of the west bank of the Nile’s mouth. There was a sharp action between the forces of the crusaders and the Muslims on the beach, though it was not a coherent, pitched battle. Individual combat was widespread, as the crusaders’ ships of seemed to land and disembark troops in a disorderly fashion, attracting charges by various Muslim contingents when they hit the shore. These appear to have been repulsed with relative ease. The weakness of the Muslim defense was accentuated by the death of the emir in charge of the Saracen troops early in the battle. By noon, the Muslim forces had retreated into the city, and the crusaders extended their bridgehead and moved supplies ashore. The defenders in Damietta, unable to get a reply to messages sent to the sultan by carrier pigeon, and fearing that he had died, soon evacuated the city. When Louis dispatched one of his knights into the city to check a report from a renegade Saracen that the army had decamped, it was discovered with what haste the Muslims had fled. Not only were large amounts of supplies and armaments found, but also the bridge of boats that connected the city to the western bank of the river remained intact. Louis’s army simply marched into Damietta on June 6, and his banner soon blew over a high tower. After the capture of Damietta, the prudent course would have been to take advantage of the disarray in the sultan’s army (made worse by the hanging of a number of the army’s leaders responsible for the ignominious retreat) and coordinate an immediate advance. But, again, Louis opted for delay. He chose to await provisions and reinforcements, including his brother, Alphonse of Poitiers, expected in the autumn. Then, too, it was important for his army to await the receding of the Nile floods, which would be at their height in July. A march toward Cairo was difficult at any time, with canals and swamps to cross; with the whole area under water, it would be impossible. Louis put off the campaign until the fall. But this delay was even more harmful to the morale of Louis’s army, and therefore to the expedition, than the delay on Cyprus. Like Hannibal’s army at Capua, the idleness of a force occupying a large, rich city fostered dissipation and a sapping of the martial spirit. Conversely, the delay allowed the sultan’s forces to regroup and rebuild, so that when the crusading army got under way, they faced a stronger enemy. This was already evidenced during the occupation by the almost continuous attacks and incursions of the Saracens against the crusader camp outside the city gates. Bedouin skirmishers regularly raided the Christian lines and beheaded those they captured. Louis forbade the crusaders to respond, in the interest of cohesion. He did not want his forces wasted on individual attacks. One such impetuous response, led by Walter of Autreches, led to his death. Louis condemned this act and ordered an entrenchment of the camp to prevent further Saracen penetrations. This sequence of events was typical of Frankish warfare against Muslim forces. The Saracens poked and probed, attempting to precipitate a rash counterattack in order to cause a weakness in the crusader forces. The task of the crusader leaders was to keep the force coordinated and resist such attacks. The advance finally began on November 20, but not before some discussion over the desirability of first capturing Alexandria to the west. Apparently, most of the king’s advisers pressed for its capture, at least according to Joinville, who echoed the feeling in his chronicle. Alexandria, the king’s councilors felt, was preferable “because that city had a good harbour, where the ships bringing food for the army could land their supplies.” But it was the king’s brother, Robert of Artois, who convinced him to concentrate on Cairo, “because it was the chief city in the kingdom of Egypt, and if you wished to kill the serpent, you must first of all crush its head.” Presumably, Alexandria was dismissed as constituting a peripheral attack that would dissipate the Christian forces without accomplishing the political aim of the crusade. Yet the real point was that control of the country was ultimately to be left to a military controlling agent, and in order for control to be established, the crusaders must first destroy the Egyptian army. Whichever route they took, this was the immediate objective with which they were faced. On the march from Damietta the crusaders, like their predecessors of the Fifth Crusade, followed the right bank of the Nile. The Christian fleet accompanied the infantry (crossbowmen and pikemen) and knights on horseback, transporting supplies and bridging materials needed to traverse the various canals, along with siege machines for the proposed attack on Cairo. Three days into their journey, unbeknownst to the crusaders, the aged sultan, Ayub, died. The Egyptians, seeing such a huge force traversing their territory, might have been irreparably demoralized by the death of a powerful and charismatic leader. Fortunately for the Egyptians, however, a member of Ayub’s harem, Sheger-ed-durr, took control of the situation. In consultation with an emir of the sultan’s court, she was able to conceal the sultan’s death and to continue administering the government and the army without serious disturbance, while the sultan’s son, Turranshah, was discreetly summoned from his provinces in Mesopotamia. The crusaders made slow progress as they faced continuous harassment by the Egyptian army. Neither did the Franks hold back entirely from counterattacks. Although forbidden to “be so bold as to attack the enemy,” some knights could not long restrain themselves. The army endured a month of this, a month of painful and slow progress during which the crusaders were forced to dam canals in order to ease the march. The army then arrived at an arm of the Nile known as the Ashmun-Tannah, across which stood the fortress city of Mansourah. Built after the Fifth Crusade at the site where John of Brienne’s forces were repulsed, and named in honor of al-Kamil’s victory, it still represented a formidable obstacle to the army’s continued advance. It was all the more daunting because the Egyptian army held the opposite shore, camped by the Ashmun before the city. The Christian army was virtually pinned in a triangle of ground between two branches of the Nile. An advance would be irretrievably wasteful, requiring a river crossing in the face of a defending force. This would negate what potential shock value the Christian knights still maintained, and their infantry would be useless as well, unless able to cross the river. A retreat, however, was unthinkable. It was soon clear that the army could not stay there, especially because the Egyptian forces were not idle, engaging in ceaseless skirmishes with the crusaders. Again, the strategy of forbearance against attack, of attempting to maintain order and discipline, was easier ordered than obeyed. The crusaders attempted to build a causeway across the Ashmun, but their engines and “cat-castles” (the works built as protection for the builders of the causeway) came under attack from the Muslim defenders. Using missiles and Greek fire, the Egyptians kept up a continuous bombardment on the causeway crew. Besides causing irreplaceable casualties and sapping the Christians’ morale, the incessant use of Greek fire on the works ultimately exposed the futility of the effort. Eventually a number of the cat-castles were destroyed by fire. At the same time, as the causeway advanced, the Egyptians undermined the farther bank, increasing the width of the river. “Thus it happened that in one day they undid all that we had done with three weeks’ labor; for as fast as we dammed up the stream on our side, they broadened its course by the holes they made on theirs,” Joinville wrote. During all this time the crusaders were under constant bombardment, with the Egyptians hurling missiles from 16 stone slings. The French replied with their own 18 machines, and an artillery duel raged between the two sides across the river. With attacks by the Egyptian cavalry on the rear of the Frankish force, though repulsed by the Comte d’Anjou (another of the King’s brothers), it was obvious that Louis’s forces could not long survive the losses they were incurring. They were still not across the river—and Cairo was yet a long march off. It was at this point that a man (Joinville says a Bedouin) came into the French camp with an offer to reveal a ford across the river, upstream of the camp, by which the crusaders could easily attain the other side. A crossing there promised the opportunity of outflanking the Egyptian camp and capturing the machines that had been hindering the work of the causeway. With the knights holding the southern bank, the causeway could be completed, and the infantry thereby advance in support. A pitched battle dispersing or destroying the Egyptian force would leave the advance to Cairo open. There is no evidence that it ever occurred to King Louis or his advisers that, even with such a circumstance prevailing, overcoming a spirited defense of Cairo would be impossible. Yet there were disturbing developments—the crusaders no longer had the ability to conduct a major siege so deep inside enemy territory, if they ever did. The Egyptian naval forces had already begun to attack the French fleet supplying the army. On February 7, the attack commenced that began the Battle of Mansourah. With a strong detachment of crossbowmen left to guard the camp, the French cavalry advanced up the Ashmun-Tannah. Their force was split into three battles, or detachments. One, composed of Templars, formed the van, followed by a battle under the king’s brother Robert of Artois (who was chiefly responsible for the expedition), and the final one under Louis himself. The Templars were to cross at the ford and first secure the far bank, allowing the others, including the king’s cavalry and some of the infantry, to cross. Significantly, Louis gave orders for all units to keep in close contact and for no advance to be made until he gave the order. Again, this was in keeping with prudent tactical alignments of the past, when faced with an enemy eager to separate the crusader forces and exploit any weaknesses they might be able to uncover. It was a wise order, and a pity for the expedition that it was not obeyed. The attack was well coordinated, starting early in the day, and achieved complete surprise. The first battles began the crossing that, though unopposed, went with difficulty. The water was deep, the bottom muddy, and the far bank steep and slick. A few knights’ mounts slipped and their riders were lost. But the van had made it to the other side when a force of three hundred Muslim cavalry appeared. The Count of Artois charged them, whereupon they fled to warn the Egyptian camp. Ignoring the king, Artois impetuously rushed after the Egyptians. 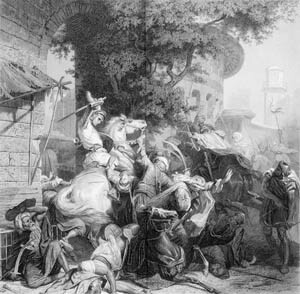 According to Joinville, this was the occasion of a dispute, for the Templars, in the van, felt they should have the honor of leading the assault. “Thinking they would be shamed if they let the Comte d’Artois get in front of them, [the Templars] struck spurs into their horses and rushed headlong in pursuit of the Turks, who fled before them,” Joinville wrote. So, without waiting for their force to adequately assemble, the crusaders split up on a wild charge toward the Egyptian camp. A case can perhaps be made that it was important to move quickly now that the advantage of surprise had been lost. With the warning that the Arab horsemen were bringing with them, the sultan, being aroused, would surely employ his men for a spirited defense. Unfortunately, as is obvious from Joinville’s reading of the response of the Templars, the attack was made more for purposes of honor than for tactical advantage. But Robert did not stop there. Instead, thinking the day already won and the enemy in rout, he ordered an advance into Mansourah. Again the master of the Templars tried to restrain him and argued for caution, but Robert denounced his advice as well as that of the Earl of Salisbury and questioned their courage. Unable to stomach his taunts they joined the charge into Mansourah. Although many Muslims fled into the city and their emir was dead, the Egyptians were not in rout. They were able to reestablish discipline within the city and fix a defense. While the crusaders poured through the open gate, the Egyptians, stationed at various points throughout the city, rushed upon them. The Frankish horsemen were unable to maneuver within the narrow streets and were thrown into confusion. Many were cut down on the spot. According to Joinville, “The Turks in Mansourah threw great beams and blocks of wood down on them as they passed through the streets, which were very narrow.” Others were able to escape on foot to be tracked down and killed or to drown in the Nile. 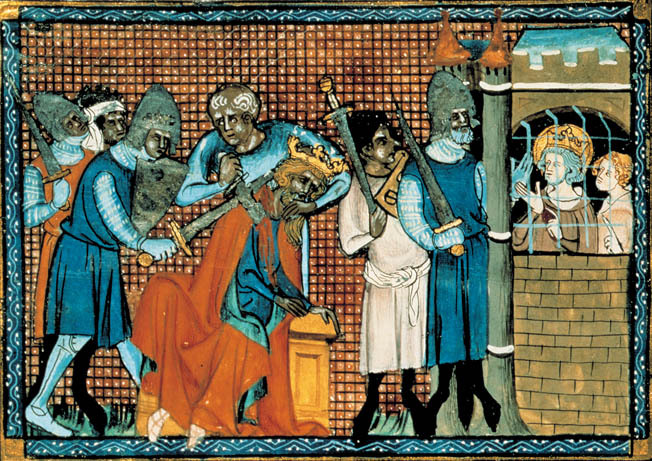 Robert of Artois, barricading himself with his bodyguard in a house, was discovered and all were slain. Also killed was the Earl of Salisbury and most of the English knights, and 280 Knights Templar, though their commander, William of Sonnac, escaped with his life. The rest of the French force, including the king, had by this time crossed the Ashmun. Hearing of the disaster in Mansourah, Louis ordered an advance. Approaching the camp, which only a short time before had been under the control of Louis’s brother, the crusaders saw that the Egyptians had regrouped and were drawn up in battle array. They soon charged at the French, pouring arrows into their ranks. But Louis’s men held them off until the Egyptians retreated due to a shortage of ammunition. A counterattack swept the Egyptians back but they soon again reformed. Meanwhile, Louis had ordered the building of a bridge to allow his infantry and crossbowmen to join the battle. To counter this effort, the Muslims effected a series of attacks on the Christian forces, trying to stop the construction of the bridge and hoping to probe a weakness, at one point even forcing the king and his party against the river. Finally, that evening, the bridge was completed and the infantry charged across. The crossbowmen were immediately drawn up to cover the cavalry. But the Egyptians, discharging their weapons to great effect, retired out of range, and the battle was, for all intents and purposes, over. Louis’s force was far too exhausted to follow up and press the attack. That evening, the infantry built a wooden embankment around the French camp. The French were now encamped with their backs against the Ashmun, which could no longer be used as a defensive moat (although many men remained in their old camp—so, in truth, the force was divided). Here they remained for almost four months, subject to numerous attacks and incursions, including a major assault, which was repulsed with heavy losses. But the fate of the expedition had been sealed and finally, after losses from battle and more from disease, and with the supply line of the Nile cut by the fleet of the newly arrived Sultan Turranshah, it was decided that the only recourse was a retreat back to Damietta. The retreat was almost as disastrous as that of the crusaders of 1221. The army was harassed by raiders on all sides, and suffered the capture of many dozens of ships by the sultan’s fleet. The weak, disease-ridden army was finally halted at the town of Fariskur. Louis himself, ill and near death, had been captured with most of the rear guard. Through lengthy negotiations, during which many more crusaders died, it was finally resolved that Damietta be restored to the sultan, along with a substantial sum, in return for the release of Louis and the remainder of the knights still held by the Egyptians. Louis went on to Acre for a time, trying to organize further crusading efforts, but eventually returned to France. Still, the passion in him would not dim. During 1270, he launched a smaller effort against Tripoli in another effort to work at the Holy Land through the southeastern flank. But he died there of disease soon after landing. The Seventh Crusade proved to be the final chance the western Christian nations had of recouping their losses in the Holy Lands. Never again was such an expedition organized. It is undoubtedly true that the battle was “a signal illustration of the essential interdependence of cavalry and infantry,” wrote a student of the battle in 1905, because of the failure of the unsupported cavalry charge. It is equally justified to claim that its ultimate futility was due to the very impetuousness of the expedition itself. Louis’s Seventh Crusade fiasco was a direct result of advancing with too small a force deep into alien country unsupported by a locally controlled strongpoint. Nevertheless, the debacle was not in the end seen as an utter failure of Western sensibilities: Louis’s sainthood was in no small part due to his sufferings at Mansourah. Tags 7th Crusade, Alexandria, Battle of Al Mansourah, Cairo, Cyprus, Greek Fire, knights templar, Mesopotamia, Pope Urban II, Saladin.